One of the things I have always loved about the Eastern Shore of Virginia is its great weather- long pleasant autumns and springs, hot parts of summer and winter quite short. And fall this year was beautiful, gorgeous blue October skies, perfect temperatures most of the time, trees more exuberant than usual in November with their colorful foliage. 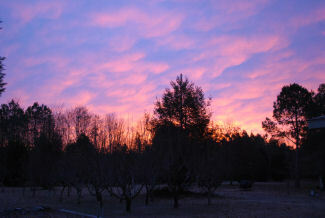 The first week of December was nice too– started out in the high 60’s and averaged in the mid-40’s. But last week was a proverbial pain in the you-know-what, with temperatures in the mid-30’s and breezy too. Definitely not my kind of weather at all but sometimes you get to take the bad with the good. And wouldn’t you know it, these chilly temps and windy days came just as we were waiting for the installer to come back to add a loop to the dog’s invisible fence. When the fence was originally installed we didn’t run it across the gate area figuring that the gate was so far away from the house that the dogs would never figure out that it was a free zone. Wrong again, the two Newfies figured it all out although it took them a while to do so. Naturally they took advantage of this new-found knowledge to sneak a visit to the dogs next door, next door being about a 50 acre farm so they have a ways to travel to make a visit. And although our human neighbor loves Pumpkin and Honey, his dogs are a bit scared of them. Pumpkin is now sized more like a small pony than a dog, Honey a close second. There is nothing in the world, including food, that Pumpkin and Honey like better than to meet other dogs and start to play, making little woofing sounds and doing the prancing around thing to encourage a game of tag. However, to a small dog, I imagine that the so-called little woofing sounds are more like a deep base barks and the prancing around likely involves having a 150 pound playmate’s foot land on you somewhere. So it’s easy to see why our dogs can sometimes be a bit intimidating to their smaller brethren. In the meantime, before the installer got here ( he does this only part-time so unfortunately, it was going to be another few days ) as the person who gets up first, I was elected to take the dogs out for their first duty call of the day, usually in my fluffy warm bathrobe, fleece scarf, maybe even gloves. The last couple of days before he came were cold and windy, unusually windy, I had been muttering hurry up, hurry up, HURRY UP as the dogs dawdled around. But then Tuesday the wind was gone, it was just beautiful, with crisp, calm air. Out there about 6:30 am, the sun was just coming up over the woods, the sky an azure blue, punctuated with small, fluffy clouds, everything overlaid with a deep, deep pink glow, just gorgeous. Zipping Honey back inside, I grabbed my camera, setting out with Pumpkin to try and capture the wintry scene. High overhead, honking geese were heading in the direction of our neighbor’s pond– the sounds always intrigue Pumpkin, although I’m never sure if she can actually see them, she does love hearing them. I was a bit late to film the very deepest colors over the orchard but the waterfront was starting to pink up nicely. Click, click, click, then back inside for a hot cup of coffee, a pot of “Machipongo Morning”, a delicious blend from the Eastern Shore Roasting Company located in Exmore, Virginia. I brewed an extra full pot because the weatherman had said we were going to get an inch or more of actual white flakes before it turned to rain. Since Northampton County almost always gets rain instead when nearby places get snow ( the moderating influence of the Chesapeake Bay and the Atlantic Ocean at our very narrow southern tip), when the weatherman says snow, I always want to make the most of this little treat of Nature, by just relaxing, coffee mug in hand, watching the flakes as they fall, fall, fall, knowing that likely they will be melted and gone by the next day. Newly dedicated this past September, the Cape Charles, Virginia Central Park was the site of the 1st Annual Grand Illumination scheduled for 6:30 Saturday evening, December 4th. My granddaughter and I arrived early after having had a nice afternoon on the Victorian Stroll, touring three lovely Cape Charles Victorian B&B historic homes. 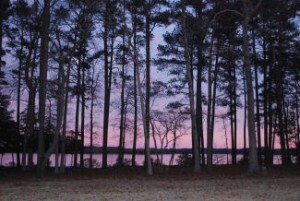 ( If you are thinking about buying a Victorian home on the Eastern Shore of Virginia, check out our website, www.blueheronva.com . ) Volunteers, like busy elves, were lighting the hundreds of luminaries that had been placed on each side of the Park’s long curved walkways and around the perimeters of the fountain, welcome points of light gleaming in the falling darkness. 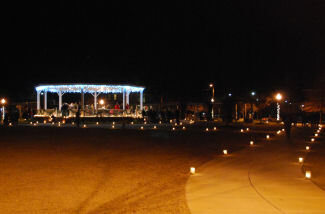 About 6:15 people started to arrive, eager to participate in this very first Illumination event for the Park, young, old, teenagers, toddlers, everybody wearing a smile, ready with cheery holiday hello, heading over to the Gazebo, following the curving path outlined by glowing luminaries. 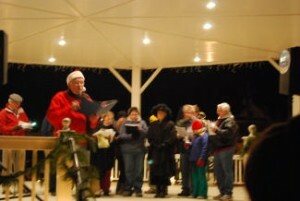 Chris Bannon ( of Seagate B&B, part of the earlier Victorian Stroll ), dressed in a bright red Santa jacket and hat, acted as Master of Ceremonies. Once everybody had gathered round the huge Park gazebo, organizers passed out candles and a choir sang a selection of carols, audience joining in. It was a pretty chilly night by Eastern Shore Virginia standards and I hadn’t brought a coat, just a blazer and scarf, having not properly accounted for the strong breeze factor. So by the time everyone was singing Jingle Bells, I was stomping my feet to the beat of the music to keep warm. Jingle bells, stomp, stomp, stomp, Jingle Bells, stomp, stomp, stomp… You get the picture. Fortunately, my granddaughter had come prepared — jacket, beanie, mittens, so at least she was toasty warm even as I was doing jazzercise steps. The candles were then lit, in honor of and in memory of loved ones, by the Town Manager, the Chief of Police and a representative of the Cape Charles Coast Guard Station who all came down into the audience to do the honors after being introduced by Chris. Candles burned brightly, another round of carols was sung, more jazzercise for me. Then the big moment was almost there, time for the Countdown to Illumination, time to turn on the thousands of lights that had been strung to decorate Central Park by the Cape Charles Public Works Department. Mayor Dora Sullivan did the honors …. 5, 4 ,3, 2, 1. Simultaneously, as instructed, the audience blew out their candles and as they did so, Mayor Sullivan threw the light switch. 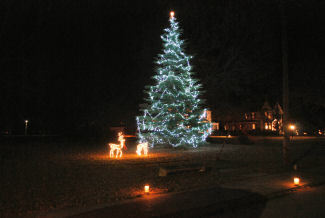 Voila, lights shone brightly throughout the Park, beautiful to behold, a reward in sparkling colors, a gift to everyone there from “Citizens for Central Park”, a group which worked tirelessly over the years to help make the Park and moments like this possible for the Town and its residents ! With the dazzling blue lights decorating the roof of the gazebo shining brilliantly above them, Santa and Mrs. Claus made a “surprise” appearance, even did a little North Pole style do-se-do for the delighted crowd, then settled down to visit with some very excited kids. Santa dispensed smiles and hugs, kids shyly whispered their gift requests, then said goodbye, smiles on their faces, candy canes in their hands, no doubt visions of sugar plums dancing in their heads. 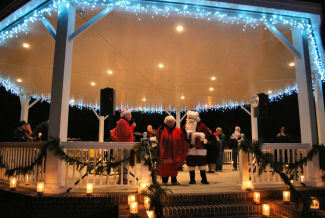 Candles, carols and candy canes, lights, smiles and friendship — highlights of the very first of what we hope are many more Grand Illuminations to come at the Cape Charles Central Park. It’s that time again, the celebrations of the holidays are upon us ! 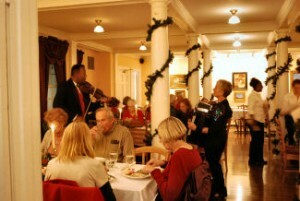 This year, three of the Bed and Breakfasts located in the historic area of Cape Charles, Virginia offered a new afternoon event, the Victorian Stroll. Entirely fitting of course, because Cape Charles is Virginia’s prettiest Victorian coastal town, especially during the holidays. 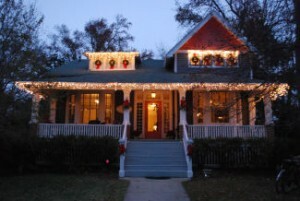 ( See our listings of Victorian historic homes for sale in Cape Charles at www.blueheronva.com ) Throughout town, eves, gables and front porches are aglow with thousands of twinkling lights in reds and greens, blues and yellows. I especially love the strings of white lights, they glitter and burn with such intensity. 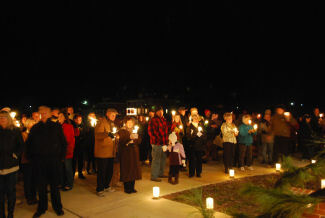 Also scheduled for early evening that same day was the 1st Annual Grand Illumination in the newly dedicated Cape Charles Central Park. So my six year old granddaughter and I decided to do the town pink and go to both events. First off on our tour was Seagate B&B, located just a stone’s throw from Cape Charles’ excellent sand beach. ( www.seagatebb.com ) Proprietor Chris Bannon gave us the grand tour of his lovely home which has the notable distinction of being the longest continuously operating B&B in Cape Charles. 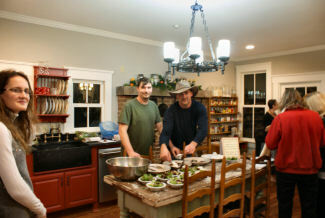 Chris had his entire home dressed to the T for the holidays but our favorite room was the formal dining room. 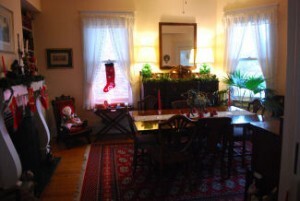 Featuring a library area and lots of antiques, the beautiful dining room looked as it must have looked in yesteryear, mantel decorated with pine roping and other greenery, elaborate stockings hung for Santa to fill, sideboard festive , classic table set with holiday candles, plush oriental rug in deep reds gracing the hardwood floor. And presiding over it all, lounging in her antique chair with soft red velvet cushions, was Raggedy Ann, large as life and awfully cute, keeping a close eye on the nearby Christmas tree, watching for more presents to appear. Then we said goodbye to Chris, who was off to Central Park to help get ready for the 6:30 Grand Illumination. Next stop, Cape Charles House. ( www.capecharleshouse.com ) Walking into the wide foyer area, we were greeted by Carol Evans, who together with her husband Bruce, operates this elegant B&B, a recipient of the coveted Governor’s Hospitality Award. Carol said that Bruce had been a bit short of time and hadn’t finished all the planned decorating but the house looked lovely to us, festive garland strung around the doors, stockings hung beneath the mantel. The large dining room table featured a luxurious arrangement of magnolia cuttings, the deep green shiny leaves perfect for the season, tastefully complementing the green wall color. Upstairs, I especially loved the decor of the “Thomas Dixon Room”, with its spinning wheel, dressmaker’s form hung with a 1900’s silk dress and ladies’ old fashioned high boot hung from the mantel. However, the hit of Cape Charles House for my granddaughter was not the great decor or the festive Christmas greenery– no, it was a huge, fat and furry white cat asleep on the bed, completely undisturbed by the swirl of people touring thorough. When she decided to pet it, kitty just raised his head, stared at her, then lay back down again, completely bored by it all— until suddenly up he jumped, making a beeline for the back stairs to the kitchen, leaving all his admirers behind ! 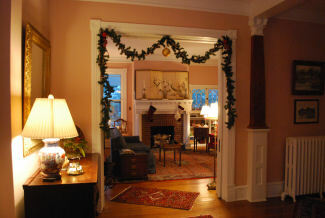 Final stop on the Victorian Stroll tour, Sterling House ( www.sterlinghousecapecharles.com ), run by proprietor Steve Hairfield with his rescued greyhound, Duelin, as the second in command. When we entered the long foyer with its gorgeous hardwood floors, Steve was kind enough to ask Duelin to come downstairs to greet my granddaughter. Definitely it was love at first sight ! Child and dog settled on the sofa to discuss secrets of the season, lights from the beautifully decorated tree glowing softly beside them. Steve has a great deal of Cape Charles artwork displayed and the paintings of scenes from the beach and marina really add to the flavor of this home where the Chesapeake Bay can be seen from the front porch. Like Seagate and Cape Charles House, the dining room at Sterling House was dressed in its best, decorated for the season and looking picture perfect, with greenery, candles, mantel pieces, striking red tablecloth and poinsettias. Dusk was well settled as we were leaving about 5:30. Outside, the long strings of bright white lights sparkled and glowed, illuminating this striking home and the be-ribboned wreathes hanging from its windows, a dazzling holiday sight. And more festivities yet to come at the Grand Illumination later ! Normally PBS has some especially great musical performances as part of their pledge efforts, offering CD’s and/or DVD’s of the performances as part of their thank-you for a pledge. Watching Saturday night’s special pledge period program, Folk Music Rewind, brought back memories of a lot of stuff I hadn’t thought about for quite a while. I guess my college years were just about the heyday of the folk music movement and like everybody I knew on campus, I loved that music. More than that, the 60’s folk music wasn’t just a reflection of changing times and changing philosophy, it was helping shape social and political opinion, not just on college campuses, but all over the country. As one of the program’s commentators said , this is music that actually changed the world. Who can forget songs like Bob Dylan’s Blowing in the Wind or Pete Seegar’s Where Have All The Flowers Gone? ( I hadn’t thought about those songs for years and years but, surprisingly, words and melody were still tucked away in the ole noggin. ) And Peter, Paul and Mary’s rendition of If I Had A Hammer ? Or Bobby Darien’s Simple Song of Freedom, which came later of course, after Bobby Kennedy was assassinated. Watching that program Saturday night was like having a wave wash over me, bringing my college days back in living color —- the concerts, the gab-fests, trudging through mile -high W. Lafayette, Indiana snow in the freezing cold ( it’s the bad weather capital of the mid-West) to get to an 8 am class, humming the latest songs, going to rallys, signing petitions, eating pizza or Stromboli while studying til midnight, cramming for exams, the luscious chocolate ice cream cones sold at the agriculture building (addicted to chocolate even then), playing bridge till the wee hours, meeting kids from all over the country, the intensity of it all. And in the background of everything, the folk music that was an integral part of our lives, a generation that thought it could make a difference, that we could overcome injustice, volunteering for the Peace Corps, marching for civil rights, demonstrating for peace. All these memories were brought back in an instant by this one great show, so thanks PBS, we love your programming. I can’t even begin to count the wonderful, commercial- free shows sponsored by PBS and their affiliates that have engaged and entertained us over the years, Masterpiece Theatre, NOVA ( www.pbs.org/wgbh/nova/), Antiques Roadshow, Frontline, Nature, everything Ken Burns, Mystery, the BBC comedy lineup on Saturday nights, Great Performances ( www.pbs.org/wnet/gperf/ ), American Experience, America’s Test Kitchen, I could go on and on and on and on, but I won’t. Well, one more—- let no one forget PBS’ superlative children’s programming ! Who doesn’t love Cookie Monster ? And it’s so easy to just go on-line to buy a copy of an especially good program through their www.shoppbs.org website. So that’s why I think that on the Eastern Shore of Virginia we are so lucky, doubly lucky in fact, to have PBS and NPR programing broadcast from stations in two directions. To the south, from Norfolk, WHRO tv (www.whro.org ) and on the radio, its two stations, WHRV fm and WHRO fm (mostly classical music) . To the north, from Salisbury, MD. , WCPB tv ( www.wcpb.org), on the radio as WSCL fm. It’s amazing that while so many other areas aren’t even able to receive clear transmissions from any public broadcasting station, on the Eastern Shore, we have two opportunities. When we’re in the car, about the time WHRV fades out driving north, WSCL just kicks right in. I mean, what would life be without NPR’s Morning Edition, All Things Considered, Prairie Home Companion ( It’s been a quiet week in Lake Webegon, Garrison Keilor’s hometown…..), Splendid Table, Science Friday (which I love but hardly ever have time to listen to ) etc., etc.. Or on Saturday mornings, if I’m in the car, Click and Clack, The Car Guys … I could really care less about car mechanicals, just want my car to run run run, but those guys are so funny and the call-in questions so zany, one can’t help but love the show, sort of like the long-gone TV series Coach— I don’t care for football but Hayden, Luther and Dauber were some funny, funny guys. So at my house we are definitely thankful to have two public broadcasting stations. And for those of our readers who are thinking about buying Eastern Shore Virginia real estate ( www.blueheronva.com ) but are afraid they might not be able to get their daily fix of Fresh Air, fear not. Like Spearmint, we’ve got double the flavor, double the fun. 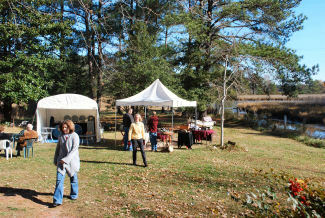 Thanksgiving weekend marked the 8th annual self guided tour of some of the Eastern Shore’s numerous art studios and vineyards. From Cape Charles on the southern tip to Chincoteague on the northern tip, the welcome mat and refreshments were out for all those folks interested in seeing artist’s demonstrations and in purchasing direct from the studio. It was the perfect opportunity to get up close and personal with the many artisans who live and work on the Eastern Shore of Virginia. As elsewhere, Thanksgiving week-end is a busy time here on the Shore, with visitors from far and near coming to celebrate the holiday. The Studio Tour is the perfect opportunity to get out and about, to see lots of nooks and crannies on the Shore, following the easy directions from the down-loadable brochure. It’s sponsored by the Eastern Shore Artisans Guild ( www.esartisansguild.org ), an organization founded about 15 years ago to promote the arts here on the Shore and to provide opportunities for their members to exhibit and market their work. The Open Studio Tour has been a raving success for both visitors and artists, it’s a great way to start the Christmas shopping season and select some unique gifts. I usually visit the venues on the southern tip because they are closest to my office and home but I decided this year to spend Sunday afternoon touring some of the studios I have never visited that are further north on the Shore. So my 8 year old grandson, who has an artistic bent, and I set out mid-morning to visit five studios: High Point Glass Works, Maurice Spector Sculpture, As The Wood Turns, Carole Meyers Pottery and The Art of The Needle. Since closing time had been set at 5 pm, we would have plenty of time to see all five if we didn’t dawdle too much, although I’m an infamous dawdler. 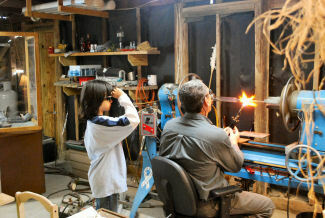 Our first stop was High Point Glass Works ( www.highpointglassworks.com) near the little town of Harborton, Virginia , where artisan Ken Platt was busy creating a lovely glass ornament. My grandson was fascinated by the hiss and glow of the flame and Ken was kind enough to invite him to put on a pair of special tinted glasses and come over to get a close up view and explanation of the process. As anyone, and especially a curious 8 year old would be, he was absolutely delighted to get this special peek into the art of glass blowing and particularly loved watching the addition of the yellow color into the glass. A steaming cup of hot spiced apple cider and a cookie kept me occupied while watching from the sidelines. And then we were off to Maurice Spector Sculpture ( www.mauricespector.com), also near Harborton, whose gallery is full of interesting pieces. I especially loved a large free form wooden sculpture, lying in repose on the back deck overlooking PungoteagueCreek, it reminded me of a tawny sea lion. Several other guest artists were in attendance with their own display tents, showing a variety of intricate decoy carvings and cast bronze sculpture. Some colorful 17 inch ceramic plates by artist David Crane were especially interesting, handsomely glazed in gorgeous deep blues and greens — I had my eye on one that was an inset for a table but I would prefer the wall hanging version, thinking of it as a birthday gift for a friend. As we left Maurice had just put a another batch of oysters on the grill for visitors– they were begining to smell mighty, mighty good ! 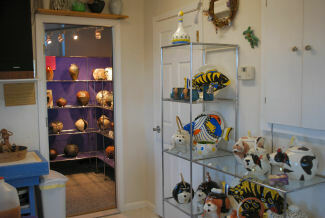 Next up, Carol Meyers Pottery, www.carolmeyerspottery.com, whose work studio overlooks the water on Smuggler’s Cove. She had a large variety of wheel thrown raku fired pots and some very nice vases and bowls on display but I was looking for one of her signature cookie jars for a daughter who has recently started to collect them. The cookie jars and teapots are hand-crafted and are quite whimsical– I settled on a sweet little lamb ! By now, time was getting a bit short and we still had two more places to visit before the closing bell. So off we went, looking for The Art of the Needle. When we walked into the little studio at Art of the Needle, barely big enough for artist Jean Loeffert, the two of us and two other visitors, I got the most delightful surprise of the day. If I knew more about art and anything about embroidery, I could write a better description of her stunning work. Although she also displays a bit of inexpensive handmade costume jewlery and some bejewledspiders hanging on silken threads, this cosy, light filled studio is home to some of the most beautiful needlework I have ever seen ! Jean characterizes her work as “painting with thread” and it truly is. 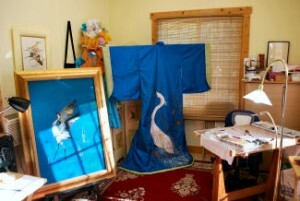 Her “canvases” are pieces of beautiful silk cloth, in different colors and textures, upon which she hand embroiders in the most intricate detail and in the Japanese style, beautiful birds, flowers and other designs. All this is done in silk thread, beautifully colored, glowing silk designs upon glowing silk backgrounds, with magnificent framing. Aside from the fantastic blue silk kimono embroidered with an absolutely stunning silvery egret, one of her most striking pieces is a heron, standing very tall, head elevated, wings outstretched , beautifully framed, a work Jean indicated took her nearly a year to complete. To me, this is museum quality contemporary art ! And she makes delicious coconut chocolate chip cookies as well……. As The Wood Turns, Let The Chips Fly ! 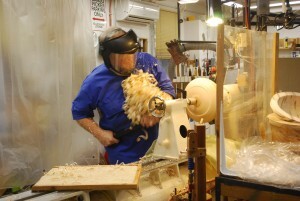 Our last stop was at the gallery of the Hoovers, “As The Wood Turns” www.brucehoover.com, near Parksley, Virginia. It was nearly 5 pm by the time we got there, the Hoovers had already swept up the wood shavings and were about ready to close. However, they kindly offered to give us a demonstration so my grandson could enjoy seeing how it’s done. Bruce showed us some of the various interesting wood he has collected, lots of interesting shapes, streaks, swirls and burls. After pulling on his tight fitting work shirt with elastic at the wrists and waist ( so clothing can’t get caught in the machinery), he cranked up the lathe and started turning a lovely piece which is destined to be a salad bowl. And the chips started to fly ! Like a spray of water from a hose, the chips flew in an arc as he worked, landing, by design, in one particular corner of the room. ( Bruce doesn’t believe in letting the chips fall where they may– he wants the chips to fall where he wants them to fall. ) Once he really got started with a little more of the actual shaping of the bowl, wood chips became wood curls, long and aromatic, piling up on his chest about 6 inches deep before gravity pushed them to the floor. Afterwards, we looked at some of his completed work, lovely teapots, bowls, even cups, all made from woods with exotic features. Bruce’s guest artist was Billy Crocket, a well-known decoy carver who was showing, among his other work, a very, very handsome specked trout which looked like it could just swim away any second. And then, as they say, all good things must come to an end, including the 2010 Thanksgiving Open Studio Tour. So we headed homeward, visions of artwork dancing in our heads. If You Want To Purchase A Boating Property But Love Horses, On The Eastern Shore Of Virginia You Can Have Both ! It seems like more and more, we are getting calls from people who are looking for boating real estate on Virginia’s Eastern Shore but who want a property where they can have both a boat dock in their backyard and horses on the property as well. Now in most areas this simply is not possible. 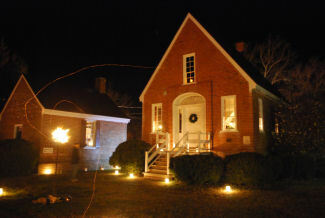 But on the Eastern Shore of Virginia, we have a number of opportunities to buy properties where you can do just that. I think one of the unique aspects of purchasing property here is that, unlike so many other waterfront areas where the land has been chopped up into quarter acre lots, or even smaller in many cases, on Virginia’s Eastern Shore, many of the available waterfront parcels range from three to six acres in size, and some are even larger. These properties with acreage present the perfect scenario for having both a boat pier and a horse on the same property. Take for example a ten acre parcel we have listed not far from Nassawadox, Virginia. A beautiful property, it features wide water views and easy boating access to the Chesapeake Bay within 10-15 minutes of the property. The best place to site a custom home would be at the top of the knoll, looking down towards the water. This would offer terrific views and the access to a boat dock would be down a gently sloping path to the shoreline. A pristine property, this waterfront acreage is a perfect purchase for a boat lover . And for a horse lover too ! 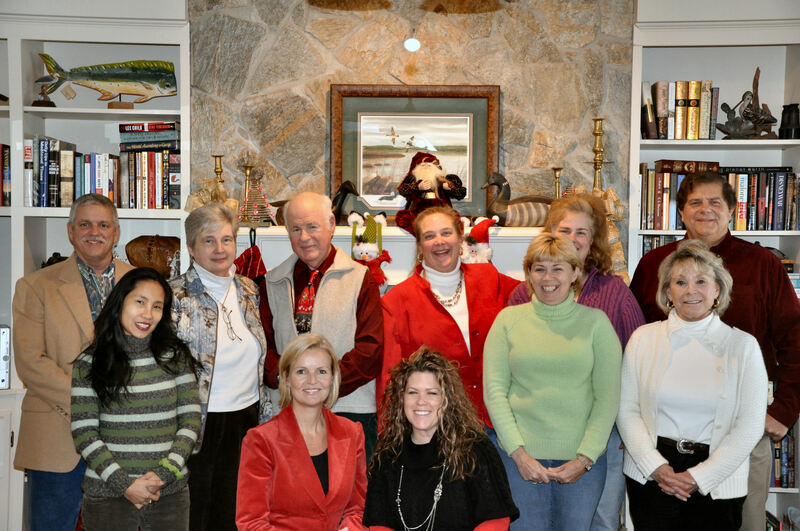 You are currently browsing the Life and Real Estate on the Eastern Shore of Virginia blog archives for December, 2010.